“This does not work!” Incident, Service Request or Problem? The discussion on the difference between incident and problem management seems to be endless. Not all ITIL trainers and consultants can agree on the answer and data shows that the maturity of problem management processes is generally low. Why is it so difficult? At one level these concepts are quite clear but closer look shows that there are problems in the definitions of the terms. The terms “incident, service request and event” overlap. The meaning of ITIL “problem” is very different from accepted meaning. In real life root cause is just one element of the problem. Aale Roos explains some alternative views on this subject which may help you to see the matter in a new light. 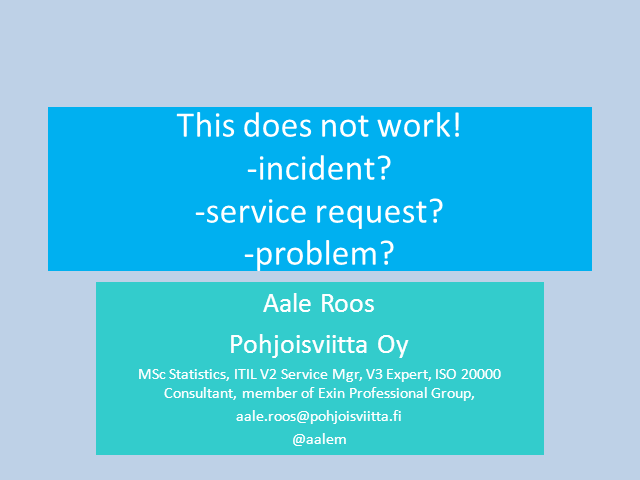 Aale who was a Customer Service manager for IT services back in 1986 is today an experienced ITSM consultant. Title: “This does not work!” Incident, Service Request or Problem?